How to install Kodi app on Android TV: Turn your Android TV box to Kodi TV streamer. If you bought a new Android TV and you want to access Kodi content (ex XBMC) but you don't know how to install Kodi on Android TV. No problem here is an easy guide to install Kodi app on your Android-based television set. Kodi is a great way to stream content to your TV from a PC or cell phone with Google's Android TV, a great way to turn on your TV from a dull to an intelligent smart tv. Though the streaming Kodi on Chromecast is a little hard while on Nexus player TV, or Nvidia Shield, Sony Android TV, Philips and Sharp TV is very easy. Here's how you can get Kodi installed on your Android TV and can be able to stream the stored content on the big screen. There are two ways to stream the contents from Kodi to Android TV. One option is to use its features Chromecast features and stream Kodi with the help of Chromecast. However, the other is much easier I recommend not even waste your time trying to tweak Chromecast. Download the Kodi APK application on the Android TV. Kodi configures the application to search for the content you have stored on the network. If for any reason you do not have access to the Google Play Store to download Kodi app, here's another way to install it on your Android device TV. 1. Go to "Settings" Android TV panel and scroll to "security restrictions". 2. Turn on "Unknown sources" in order to install applications outside of the Google Play Store. 3. 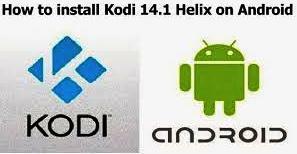 Download Kodi Android app fro the download page of Kodi - depending on the hardware, you need to select the ARM version or x86. 4. Copy the downloaded APK file to Google Drive or USB drive and connect to your Android TV. 5. Go to where you stored the APK file with ES File Explorer or other file management application.Open the .apk file that was asked to install Kodi and select "Install".Once the file is ready for transfer from your device, you are prompted again to install Kodi. 6. Select "Install" Kodi will install and operate exactly as if it were downloaded from Google Play Store. 7. Set Kodi so that you can see the content that you have saved on the network. 8. Done. Now you have completed the installation of Kodi, it's time to fill your Android device Apps TV around in a top selection of the best Android app for Android TV.